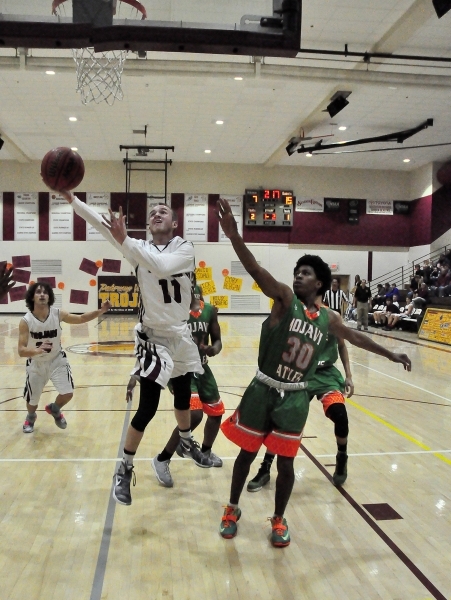 Bryce Odegard and Danny Foss both had 23 points to lead the team in a loss to Mojave at home. The Trojans lost 77-59 on Friday. 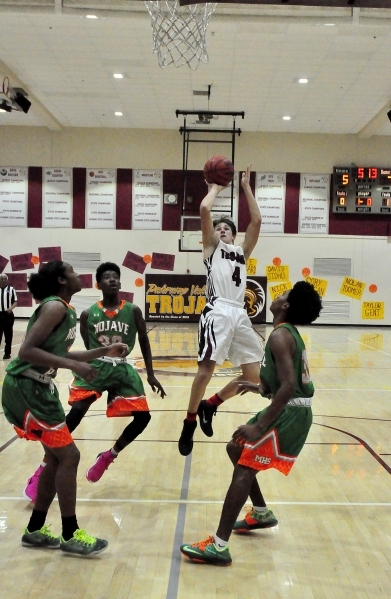 Trojans coach John Toomer praised his team (2-11 overall, 0-6 Sunset League) for their efforts. He said his boys are shooting 34 percent and wants them at 50 to 60 percent. Fifth place Mojave (7-6, 2-3) led 22-36 and never looked back. The Trojans hit the road for three games. They played Spring Valley (6-6, 1-3) on Tuesday, which was past deadline, this Saturday they are at second place Faith Lutheran (11-4, 4-0) at 6:30, and are at first place Clark (14-3, 6-0) on Monday at 6:30 p.m. Pahrump returns home to host third place Sierra Vista (6-11, 4-2) on Wednesday at 6:30 p.m. 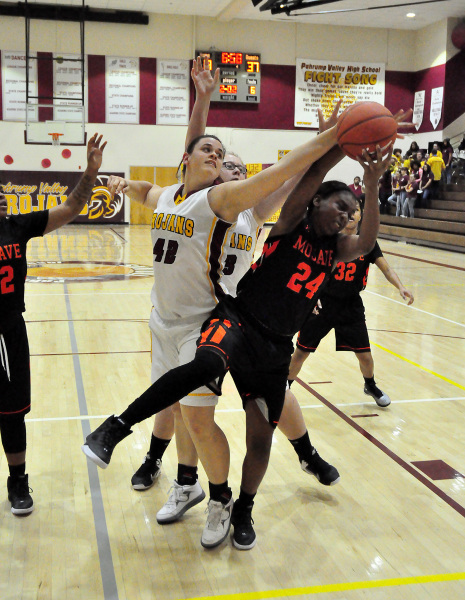 The Trojans girls team was downed by Mojave on Friday 42-25. Mojave (6-7, 2-3) made 14 field goals but went to the line 18 times and made 9 of them. The Trojans (1-7, 0-6) went to the line only seven times but made 5 of them. Mojave had to forfeit two league games because of a fight they had against Canyons Springs so their record does not reflect the caliber of team they are. Lauren Ashford led Pahrump with 8 points and Andi Bishop was second with 6 points. The girls hit the road for three games. They played division leader Spring Valley (15-3, 4-0) on Tuesday, which was past deadline. This Saturday they are at third place Faith Lutheran (11-5, 3-1) at 6:30, at Clark (4-14, 2-4) on Monday at 6:30 p.m., and then host Sierra Vista (7-9, 3-3) on Wednesday at 6:30 p.m.
Beatty girls basketball beat Adelson School on Thursday 63-30. Denise Gonzalez led the Hornets with 20 points. Arianna Oseguera added 13 points and Maggie Cathcart scored 12 for the Hornets, who led 32-15 at the half. The girls are at Round Mountain this Thursday at 4 p.m.